I was recently approached by Odin himself, who was in a state of fury. He was being plagued by nightmares caused by a single unanswered question. “This has been gnawing at me since before Thor and Loki were even gleams in my eye!” he thundered. This question is, of course, who are the top five recurring Star Trek characters? He appointed me, personally, to investigate this matter and come up with an answer for him. And over the next five weeks I shall do just that. Lwaxana made it on this list because, apart from being one of the most entertaining recurring characters on Star Trek, she is also one of the most versatile, with the most unexpected back story. At first glance, Lwaxana appears to be a shallow, egotistical harpy. And at first she sort of is. She first appears in the TNG Season One episode “Haven” like a whirlwind of silk and hormones. She brings the unwelcome news that Deanna is to honor her arranged marriage to the son of her father’s old friend, and immediately lusts after Picard. You get a bit of her softer side as she reflects on her late husband Ian, but most of what you get is comic relief in the form of sexual innuendo. There are also some great scenes of Lwaxana talking to the computer, which is also voiced by Majel Barrett. As she makes comeback after comeback, much to the dismay of Captain Picard, you learn about the real Lwaxana, who loves her daughter and loved her husband but has suffered major losses that have forced her to bury her emotions beneath layers of fancy clothing, jewelry and ostentatious behavior. One of Lwaxana’s most memorable appearances is in season seven’s “Dark Page”, where Lwaxana’s life is threatened by a mysterious telepathic illness. As Deanna probes into her mother’s unconscious, she discovers that Lwaxana had another daughter, Kestra, who drowned during a family picnic. Lwaxana blames herself. So why is Lwaxana No. Five? Because she is a character you can’t forget. She makes Picard shudder, Odo squirm and Deanna fume. She is rude and obnoxious and we love her for it. The icing on the cake is that, over time, the reasons she behaves the way she does are delved into and we see that she is not just a one-dimensional, bombastic caricature created for comic relief, but a highly motivated character with an intense backstory. So let’s raise a glass of Altairian brandy to our number five. 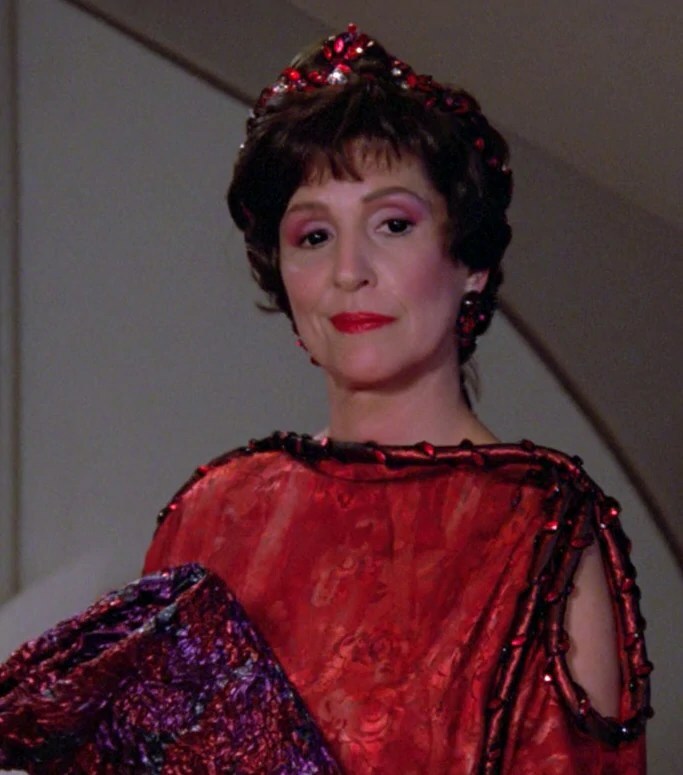 Lwaxana Troi: The mother you just can’t lie to!